EMI / RFI gasket materials are used to attenuate electronic emissions from electronics and electro-mechanical devices. 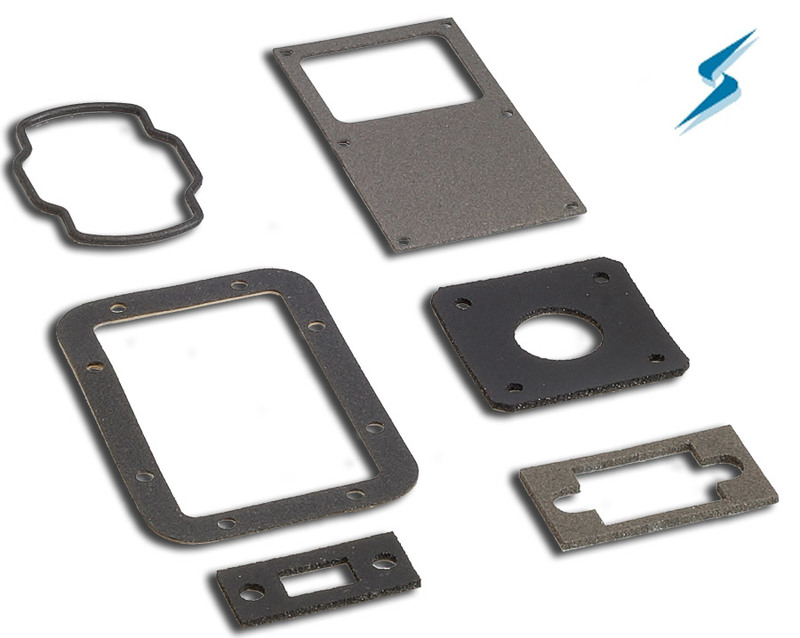 Electrically conductive gaskets/EMI shielding gaskets are most commonly applied to enclosure covers, doors and penetrations to prevent or restrict electromagnetic emission that can interfere with other electronic components. Critical devices are also tested for EMI susceptibility, ensuring external EMI and RFI emissions do not interfere with the function of the device. In addition to managing EMI emissions and susceptibility, Stockwell Elastomerics’ conductive gaskets are used for environmental sealing. With proper compression, these gaskets can seal out rain (NEMA 3), withstand pressure washing (IP65, IP66, NEMA 4X) and prohibit water ingress during submersion (IP67, NEMA 6). EMI shielding materials are an extension of Stockwell Elastomerics’ silicone rubber capabilities – EMI gaskets can be die cut, water jet cut or compression molded from electrically conductive silicone rubber compounds with age and weather resistance or conductive fluorosilicone rubber for additional chemical resistance. Includes small samples of EMI gasket materials to touch and feel. Nickel-graphite filled compounds have been developed with high shielding effectiveness values (over 100dB from 100MHz to 1GHz) at a cost far less than silver filled compounds. Further, nickel-graphite filled silicones withstand harsh environmental conditions including salt fog/spray, UV and ozone. Nickel-graphite filled silicone gaskets are widely used for commercial applications where the higher cost of silver or copper filled materials is prohibitive. Industries such as lighting, signage, and instrumentation that historically haven’t required EMI attenuation, now do as a result of integrated electronics for “smart” features and tighter regulations. With more innovation and mobile devices, EMI emissions will need to be addressed by designers of OEM equipment – and often at the end of the design cycle. Stockwell Elastomerics offers nickel-graphite filled silicones, readily available from inventory, in sheet form with thicknesses: .020″, .032″, .045″, .062″, .093″, and .125″ to support prototyping and fast-turn gasket production. Customers can send a CAD file, .stp or .dxf of the gasket design so Stockwell Elastomerics can determine the best choice of material and provide a waterjet cut gasket for testing. Designers in defense and aerospace related applications are now specifying nickel-graphite filled silicone gaskets for custom molded gaskets, O-rings and fabricated gaskets, thereby reducing costs of applications where silver filled or silver plated particle filled compounds were previously specified. These compounds have been specified for applications ranging from seals for power supply gaskets to enclosure gaskets. The SNE-540, 40 durometer and SNE-556, 65 durometer nickel-graphite filled silicone compounds in particular have been subjected to extensive testing by several independent testing facilities. Along with shielding effectiveness values (see chart below), independent testing determined the thermal conductivity of SNE-556 to be 0.8 W/m-K and Low Temperature Flex, TR10 to pass at -40°C. Stockwell Elastomerics inventories uncured nickel-graphite filled silicone compound as well as cured sheets from .020″ to 0.125″ thicknesses. If sheets are not immediately available, Stockwell Elastomerics’ on-site Molding operations can quickly produce sheets to support requirements for die cut and fabricated gaskets. The standard sheet size is 15″ x 20″. If 15″ x 20″ standard sheets are not suitable due to large gasket dimensions, continuous roll material SNE-540-C is available in .010″, .020″ thick and .032″ thick rolls up to 15″ wide, custom thicknesses are available upon request. Continuous format offers designers the ability to design EMI shielding gaskets for larger enclosures with fewer splices. Stockwell Elastomerics has on-site water jet cutting for precise corner jointed gaskets and tightly fitting splices for environmental and shielding integrity. Stockwell Elastomerics offers 3M 9713 conductive acrylic adhesive or 3M 9719 conductive silicone adhesives. Electrically conductive adhesives are laminated to EMI / RFI materials for ease of installation. 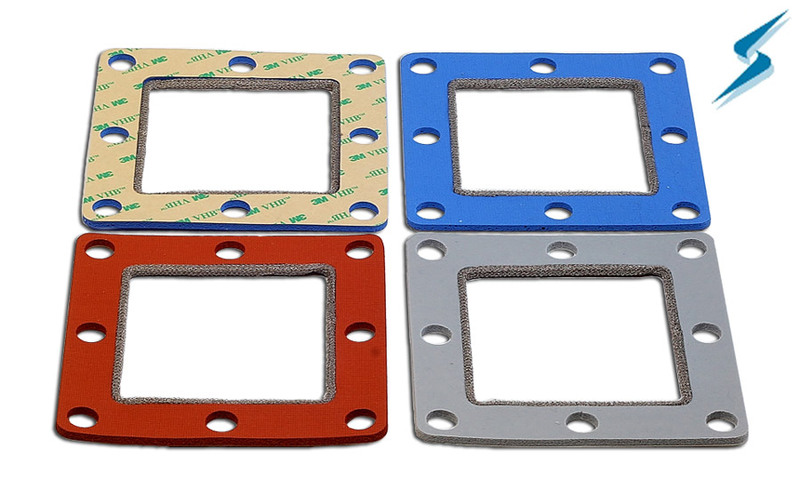 Request a sample swatch of SNE-5XX series EMI gasket materials via the contact form. SNE-540-R and SNE-556-R are 40 and 65 durometer (Shore “A”), respectively, with low volume resistivity that challenges silver coated aluminum filled silicones. SNE-540-R and SNE-556-R have conductive fabric reinforcement that enhances the conductivity and tensile strength while maintaining Z-axis compression for EMI and environmental sealing. It is typical for particle filled silicone rubber materials to have lower strength as a result of heavy loading of conductive filler. This lower strength is often problematic for gaskets with thin walls that are susceptible to breaking from over stretching. The fabric reinforcement in the SNE-540-R and SNE-556-R materials addresses these issues. 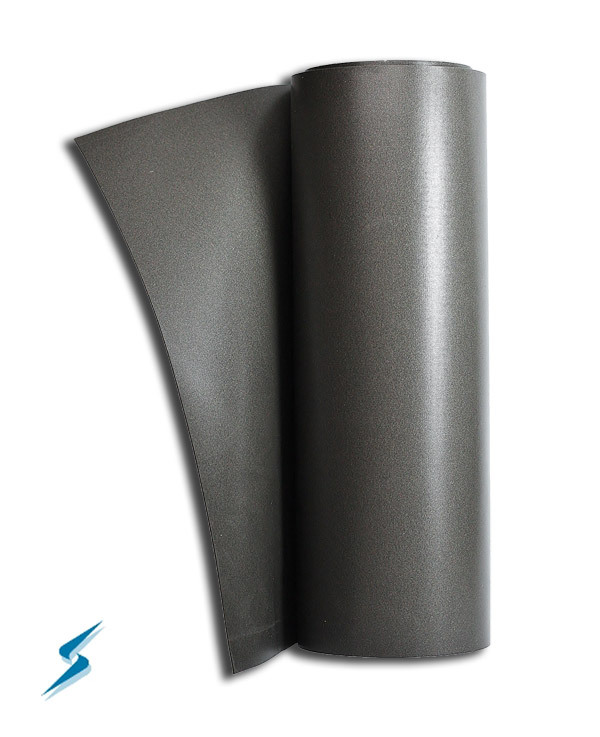 SNE-540-R and SNE-556-R fabric reinforced EMI silicones are manufactured in continuous rolls that are 12″ and 15″ wide. 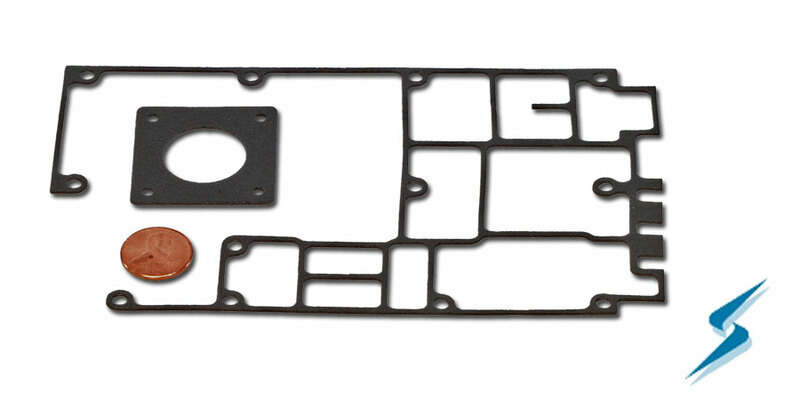 Continuous EMI gasket material enables large EMI gaskets to be made in one piece. Standard thicknesses are .020″ and .032″; custom thicknesses are also available. EMI enclosures with bolt patterns benefit from the dimensional stability that comes from conductive fabric reinforcement. 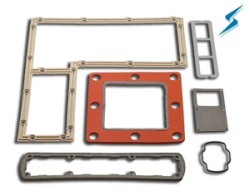 The reinforcement prevents the gasket from stretching during installation, ensuring hole alignment with gasket and bolt pattern in the enclosure. 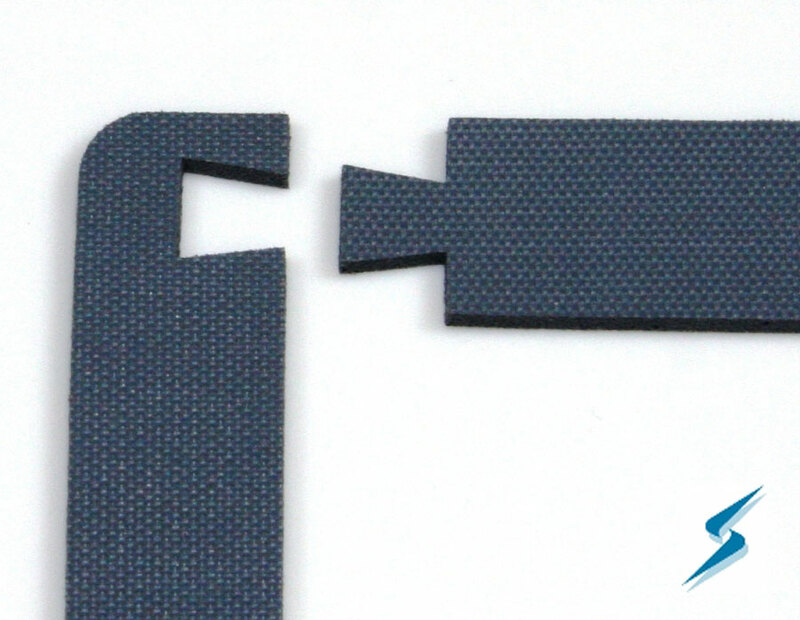 EMI gaskets with narrow walls benefit from the conductive fabric reinforcement that allows the part to be handled and installed without over stretching / breaking. Stockwell Elastomerics offers 3M 9713 conductive acrylic adhesive or 3M 9719 electrically conductive silicone adhesives that can be laminated to these reinforced EMI gasket materials for ease of installation. More complex designs, extending beyond flat cut shapes, are custom molded by Stockwell Elastomerics on-site in the United States. Compression molds are used to produce custom EMI gaskets and custom conductive parts. Three dimensional designs allow for tighter tolerances and the use of shape factors to reduce the closure force on the filled conductive polymers. In the right quantities, molding custom EMI gaskets offers engineers significant unit cost savings over die cutting. EMI / RFI gasket materials tend to be higher in cost compared to unfilled silicone compounds; this is especially true for silver filled EMI compounds. The material savings associated with molding very often offsets the higher tooling cost of a custom mold. Generally, if the production quantities are expected to exceed 1000 pieces, the initial tooling investment in a compression mold will pay off with a reduced unit cost. Stockwell Elastomerics inventories nickel-graphite EMI sheet material made from the same compounds used to mold custom EMI components. 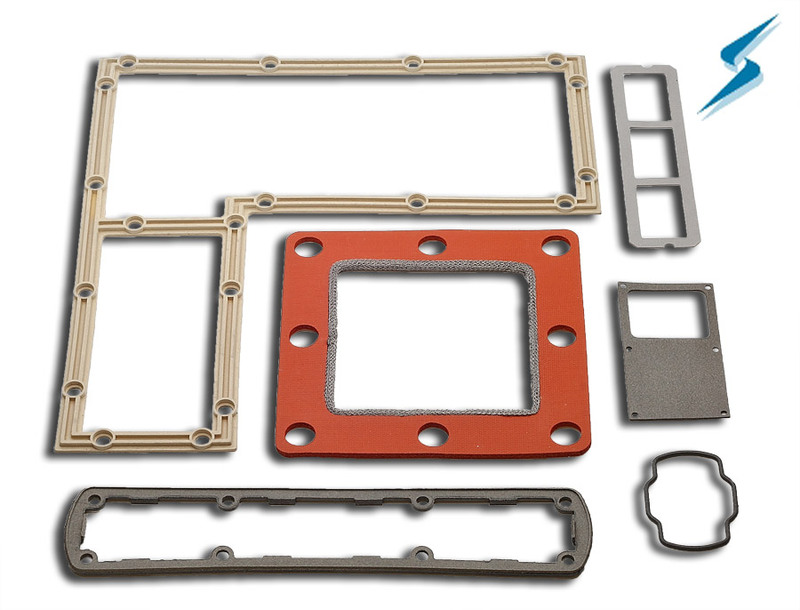 Stockwell Elastomerics can waterjet cut low volume EMI / RFI gaskets to prove out engineering designs, then these designs can be easily tooled up for molding when parts move into pre-production and production phases. Stockwell Elastomerics is based in Philadelphia, PA and all gaskets and components are manufactured at this single location. Stockwell Elastomerics is an ITAR registered manufacturer, Cage Code 87585. Additionally, all electrically conductive molding compounds and molds used by Stockwell Elastomerics are manufactured in the United States and certified with supporting test data. Stockwell Elastomerics is committed to supporting medical, defense and other sensitive industries that require the highest quality and material lot traceability. Stockwell Elastomerics has partnered with Specialty Silicone Products (SSP) to develop product offerings in nickel-graphite filled silicone and fluorosilicone compounds, supplied with physical test reports to ensure properties are consistently met. PPI of Width Volume Res. * SNE-540 and SNE-556 tested for Shielding Effectiveness by DLS Testing Laboratories. Rogers Corporation’s EC-2130 nickel-graphite filled silicone rubber is a compressible 30 durometer electrically conductive gasketing material. EC-2130 is the only nickel-graphite filled gasketing material available in 36″ wide continuous rolls making it ideal for large EMI gaskets. Available in .062″ and .125″ thickness, EC-2130 is UL 94HB flame rated. Application of 3M #9713 conductive fabric supported acrylic adhesive provides both a conductive adhesive surface for EMI shielding integrity and dimensional stability to reduce tears during handling and assembly of this very conformable material. Note that Rogers EC-2040, 40 durometer nickel-graphite filled silicone was recently discontinued. However, SNE-540, 40 durometer nickel-graphite filled silicone is now produced in continuous rolls .020″ thick x 15″ wide and .032″ thick x 15″ wide to replace EC-2040 in Stockwell Elastomerics’ product line. Military electronics such as communication equipment and radar equipment requiring maximum shielding effectiveness from high frequencies often require silver or silver plated particle filled compounds. Stockwell Elastomerics has teamed up with Specialty Silicone Products (SSP) to specify compounds with silver plated aluminum fillers having a tight particle size distribution. This provides consistently low volume resistivity and a smooth surface condition that contributes to Stockwell Elastomerics’ ability to compression mold these compounds into custom gaskets. Each of the silver plated aluminum filled compounds listed below are available in sheets that are .010″, .020″, .032″, .040″, .050″ and .062″ thick for gasket fabrication. On-shelf inventory in .020″ and .032″ thicknesses is frequently available to support fast-turn initial production requirements and limited material sampling for evaluation. Compounds for Stockwell Elastomerics’ silver plated aluminum filled silicones and fluorosilicones are supplied with physical test reports to ensure properties are consistently met. * SCF-444 and SCF-447 are fluorosilicone base compounds for fluid, fuel and oil resistance. The main advantage of EMI shielding gaskets fabricated from conductive elastomers is the combined benefit of environmental sealing over a broad temperature range along with EMI shielding. This EMI gasket material is typically silicone rubber or fluorosilicone rubber with embedded silver plated aluminum particles, silver plated glass beads, silver plated copper particles, nickel-graphite particles or conductive carbon. Many of these EMI shielding materials meet the properties of MIL-DTL-83528. Conductive silicone rubber materials are typically molded into sheets from .010″ to .125″ thick and 12″ x 12″ to 10″ x 15″ in size and then die cut or water jet cut to the final gasket configuration. Enclosures requiring environmental gaskets that seal out dust and rain sometimes also require EMI / RFI shielding. Industries such as telecommunications, military and smart grid require long term sealing as well as EMI attenuation; often these larger enclosures have low closure forces due to sheet metal construction or limited latches. Stockwell Elastomerics offers combination gaskets made from closed cell silicone sponge or silicone foam with knitted wire mesh cord bonded to the edge of the gasket. The soft sponge and wire mesh construction allow for thicker gaskets that can be compressed with less closure force as compared to particle filled silicone gaskets. Large enclosures and server racks benefit from Stockwell Elastomerics’ combination EMI gaskets since the thicker material (0.125″ – 0.375″) allows for more gap filling created by tolerance stack ups in large parts. 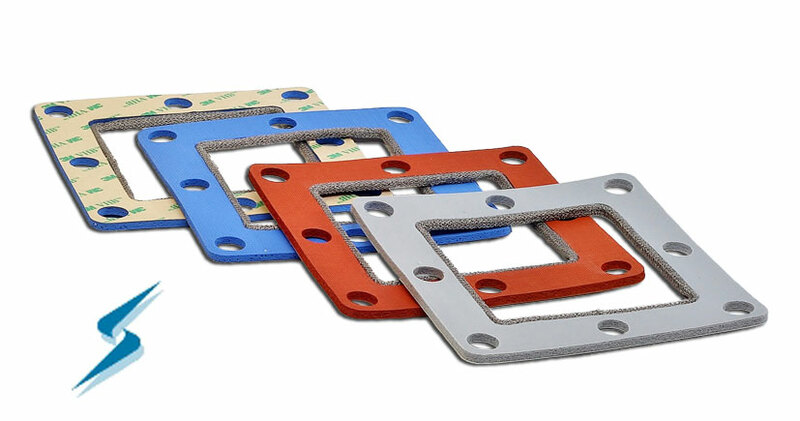 Compared to metal filled EMI gaskets, Stockwell Elastomerics’ combination sponge / wire mesh gaskets are very soft. Softer means less compression force needed to properly compress the gasket for a seal. Filled silicone EMI gaskets may require 150 – 300psi to deflect the gasket 33% whereas the sponge/mesh takes 15 – 50psi (depending on the sponge used). Stockwell Elastomerics is a leading supplier of custom silicone gaskets and silicone components for commercial, industrial and defense applications. For this reason, a full inventory of silicone sponge products is maintained that can be combined with Monel wire mesh cord to make a combination EMI gasket. 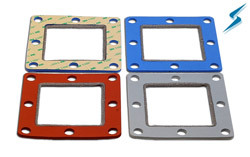 These EMI gaskets are cut to customer specifications and drawings. Server rack gaskets and large NEMA enclosure gaskets can generate significant waste if cut from a single piece of silicone sponge. 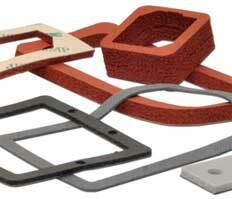 To help reduce waste and associated costs, Stockwell Elastomerics offers corner bonded gaskets. Dovetail and other interlocking joints are cut into the four legs of the gasket and bonded in a secondary process. Corner bonded gaskets are available with or without the Monel wire mesh cord used for EMI gaskets. Particular applications require a higher level of chemical resistance for exposure to fuels or cleaning agents. Stockwell Elastomerics offers combination EMI gaskets made from closed cell fluorosilicone sponge and knitted monel wire mesh. UL 50E silicone foam and silicone sponge are available to make EMI combination gaskets. While the final configuration of wire mesh and sponge has not been qualified by UL, the silicone foam and silicone sponge have been tested to UL 50E gasket standards. In addition, the silicone foam also meets UL 94V-0 flame rating. This video offers a simple visual demonstration of the conductivity of various EMI shielding gasket materials. The tan material in the video has silver coated aluminum particles, the dark grey material is nickel coated graphite. The last example shows a 3M conductive adhesive where the conductive path flows through the metal plate, up through the adhesive, through the conductive material into the LED. Contact Us for further assistance with EMI shielding materials, conductive elastomers, and electrically conductive silicone materials to manufacture EMI gaskets.